A few days ago, Tristan Hoare and Julien Dobbs-Higginson opened the doors to the Wilmotte Gallery for ‘The Ruins of Detroit’, a collaborative exhibition of photographs taken by Yves Marchand and Romain Meffre. 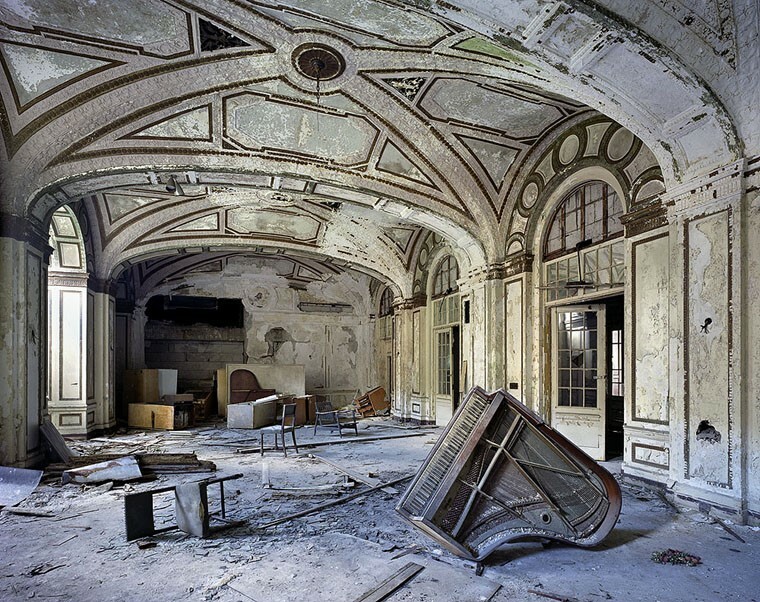 The series of images details moments of decomposition to tell the devastatingly beautiful story of a city in decline. We speak to the pair following the launch to find out more about the relics and why their symbolic significance goes far beyond the gallery’s four walls. Dazed Digital:Detroit has a long and complex history. How did these buildings come to be in their current state of neglect? Yves Marchand and Romain Meffre: It is possible to look at Detroit as the capital of the 20th Century. In 1913 Henry Ford established his first assembly lines and created mass production and mass consumption. The meteoric rise of Motor City, car capital of the world, was followed by a dramatic decline in the 1950s which saw machines replace humans and plants relocated to the suburbs and eventually abroad. During the following decades Detroit struggled with terrible urban and social problems. Cars and roads moved people from the inner city to the new suburbs and the city went from nearly two million inhabitants in the 1950s, to a little over 700,000 today. The city that constructed the product that shaped our way of life also laid the ground for the conditions that caused its downfall. Today’s Detroit is an archetypal American city in a state of abandonment. DD: What is it that draws you to images of decomposition? Yves Marchand and Romain Meffre: Ruins are the visible symbols and landmarks of our societies and their changes are small pieces of history in suspension. There is nothing more exciting than visiting something mysterious like a derelict castle or an abandoned theatre. As we explore deeper into the ruins the journey raises ideas and questions and we learn about architecture, society and history. What is interesting for us is the confrontation between the ideas embodied in the architecture, such as optimism, power, belief, creation and fantasy and the transformation into ruin, the end of the cycle. This change is very powerful. Ruins are a spectacular demonstration of our nature and its paradoxes, our ability to create and self-destruct. DD: Does Detroit represent a much wider civilization in decline? Yves Marchand and Romain Meffre: When exploring ruins one can’t help feeling a bit like an archeologist discovering ancient temples from a forgotten civilization. We hope that our images give the viewer this feeling. In some way Detroit can be considered the empire which gave birth to our modern civilization. An empire that grew quickly and fell within 100 years. This idea is reinforced by Detroit’s liberal use of motifs from previous civilizations. For example Michigan Central Station was inspired by the baths of Carracala in Rome. DD: There's also a certain narrative quality. As though the people have been removed but their tale left behind. Is nostalgia an important theme to you? Yves Marchand and Romain Meffre: Our intention is create a document. The photographs are a souvenir of a moment, a time and place. It is inevitable that this will create an element of nostalgia, but we didn’t look for it. We spent so long among the ruins that we have got used to their present state of being. We often find that people looking at the images for the first time will have a much stronger fantasy looking back to the glory days of motor city.